(i) Chain Survey and Compass survey. (ii) Trapezoidal rule and Prismoidal rule. (iii) Surveyor's compass and Prismatic compass. (iv) Rise and fall method and Plane of collimation method. (ii) Combined corrections for curvature and refraction and Error in collimation adjustment of the instrument. 2(b) Write a detailed note on obstacles in chain surveying. 3(a) Compare closed traverse and open traverse. 3(b) Compare well-conditioned and ill conditioned triangle. 3(c) What is a local attraction? Which are the methods of elimination of local attraction? 3(d) Describe advantages and disadvantages of plane table survey. 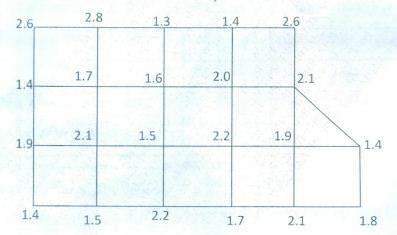 5(a) Calculate the volume of earth removed for a piece of borrow pit shown. At the corners, the data mentioned is amount of cut in meters. Each square is 9m*9m. 5(b) Describe in detail procedure of taking bearing of a line with theodolite. 5(c) Explain in detail the use of theodolite as a level. 6(a) Define contour. Explain the methods of interpolation of contours. 6(b) Describe the working of Amsler's planimeter. 6(c) Explain how the project of theodolite traversing is executed?